I thought it was about time that Lil Pip had its very own blog. I feel like I have lots to say, so hopefully I can update you on everything that is going on in my world. I currently have two obsessions (amongst oh so many!). Pinterest and crochet! "Pinterest lets you organize and share all the beautiful things you find on the web. People use pinboards to plan their weddings, decorate their homes, and organize their favorite recipes." If you haven't already had a look, do yourself a favour and pin today! Inspired by a customer and seeing all the gorgeous photos on Pinterest, I decided this week to teach myself to crochet. YouTube is a wonderful thing really! I've started pretty basic and made a couple of granny squares. 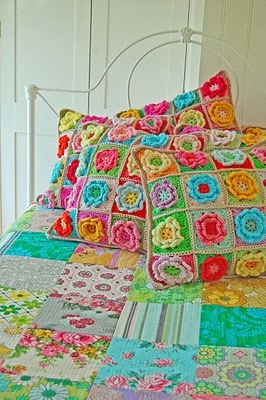 They might only become a cushion but I would love to make a little blanket for each of my gorgeous kids. 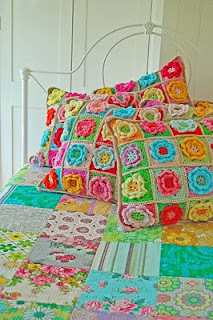 This Pretty Flower Square Pillow would be beautiful for my little girl. Ahhh, yes you tube....keep trying to teach myself to crochet(from a book) and failing miserably! Will have to try you tube! And Pinterest.....signed up and too scared to have a look around for fear of forgetting what my kids look like! Looking forward to reading your blog.